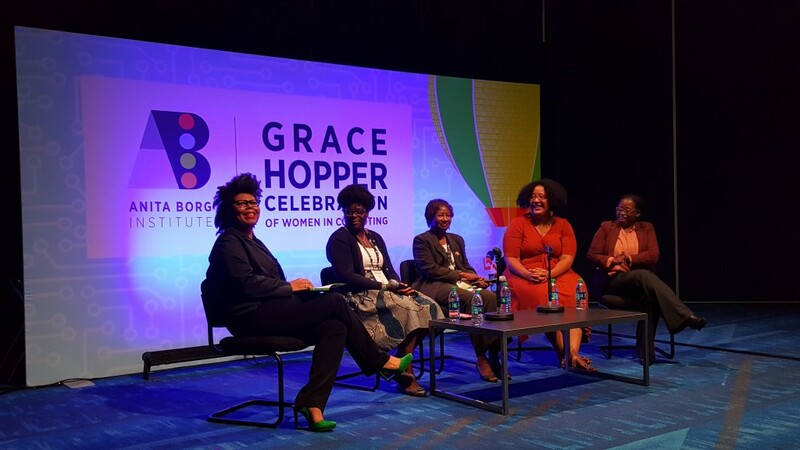 This year’s GHC featured a panel titled Owning Our Voices: Celebrating Black Women in Computing. During this panel session the BWiC video narrative was screened and Dr. Jamika Burge lead a discussion about the importance of sharing narratives that portray black women and girls in exciting, innovative, and multi-faceted technology roles. The panel included Dr. Jamika D. Burge, Founder and Principal of Design & Technology Concepts, LLC; Dr. Mave Houston, Founder and Head of USERLabs at Capital One; Dr. Quincy Brown, Assistant Professor at Bowie State University; Dr. Sandra K. Johnson, Founder and CEO of SKJ Visioneering, LLC; and Dr. Gloria Washington, Assistant Professor at Howard University.